The Avro Vulcan, sometimes referred to as the Hawker Siddeley Vulcan, is a delta wing subsonic jet strategic bomber that was operated by the Royal Air Force(RAF) from 1953 until 1984. It was developed by Avro in response to a specification released by the Air Ministry. At the time, both jet engines and delta wings were considered cutting-edge and relatively unexplored; thus, the small-scale Avro 707was produced to test the principles of the design. In flight, the Vulcan was an agile aircraft for its size. The Vulcan B.1 was first delivered to the RAF in 1956. In service, the Vulcan was armed with nuclear weapons and was a part of the RAF's V bomber force, the United Kingdom's airborne deterrent against aggression from other powers such as theSoviet Union during the Cold War. Features such as an extensive electronic countermeasures suite and a low radar cross section for its size would have made the aircraft difficult to detect while carrying out the nuclear strike mission. A second batch of aircraft, the B.2, was produced with new features, including a larger wing and greater fuel capacity, along with more advanced electronics and radar systems. The B.2s were adapted into several other variants, the B.2A carrying the Blue Steel missile, the B.2 (MRR) for Marine Radar Reconnaissance use, and the K.2 tanker for aerial refuelling. The Vulcan was also used in the secondary role of conventional bombing near the end of its service life in the 1982 Falklands War against Argentina during Operation Black Buck. 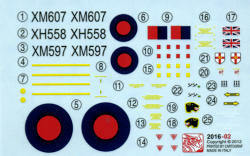 One example, XH558, an aircraft depicted on this kit's decal sheet, was recently restored for use in display flights and commemoration of the employment of the aircraft in the Falklands conflict. This is Cyber-hobby's second boxing of this bomber and while many of the parts are the same as the earlier kit, there are some major differences. Now you wouldn't expect this to be very parts intensive. 1/200 isn't really all that large. Hasegawa has been doing airliners in this scale for well over 30 years for those who don't have a ton of room to display models. This one comes on two grey and one small clear sprue. The clear sprue is for the canopy and the bomb aimer's window. 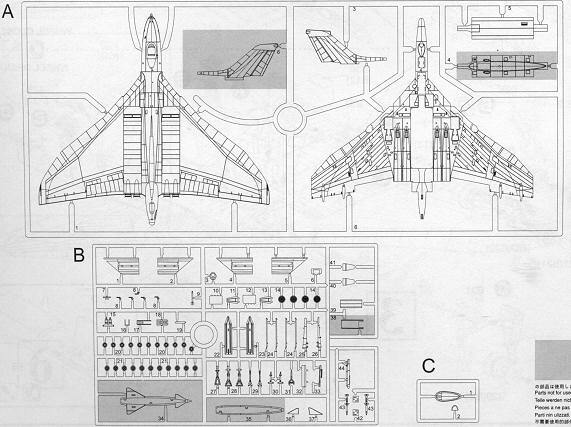 Two of the others contain the upper and lower airframe plus the fins on one sprue and the lower fuselage center section on the other. The upper body piece includes the full engine intake openings and the elevons. The other sprue contains all of the small bits. This includes the engine intake sections (which are installed via the open lower fuselage piece, a neat idea), the Blue Steel missile, landing gear, gear doors, wheels and the cockpit bits. Yup there are a pair of seats, instrument panel, and two crew figures for the cockpit, though you could easily paint the inside of the transparency black as little will be seen. For the really small bits, there are separate wheels (good luck getting the hubs painted), air refuelling probe and some small air data sensors. The lone option seems to be to build the plane gear up or down. Separate bits for retracted gear are supplied for those who want to build a display stand for it. Some bits are not used with this kit are the early fin, the Blue Steel missile and the hollowed out bomb bay area that was required to carry this weapon. This boxing has the different late fin with ESM antenna, a new tool set of wings to improve the fit and the ALQ-101 jamming pod. Markings are for three planes. One is in the wraparound scheme of green and grey with markings for 27 Squadron. This is the plane that is still flying. The other has a Dark Sea Grey underside with basically two different serial numbers for planes from 44 Squadron and 101 Squadron. There is a small decal sheet, crammed into a zip bag that is .001 microns larger than the sheet, to provide markings for these options. 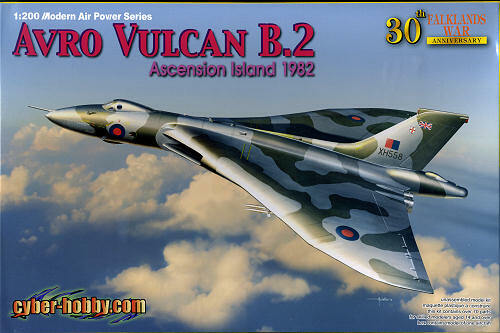 For those of us who may not have the room for a 1/72, or the huge 1/48 or even a smaller 1/144 Vulcan, this is a great way to get one of these in your collection.